Attention anime and indie animation fans! 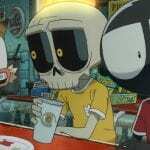 GKIDS is releasing a new film for you to enjoy called MFKZ. This wild and crazy film is coming to theaters October 11 and , October 16. From the creators of Tekkonikreet (Shojiro Nishimi and Shinji Kimura) comes a mash up of anime, scifi, film noir, video games and more. This gives us a dark but stunning animated film you won’t want to miss. Make sure to enter the giveaway for 2 tickets and MFKZ merch!